This salad is from Smitten Kitchen. It takes about 5 minutes and there are a ton of ways to adapt it. Add some chopped summercrisp lettuce or arugula for bulk. If you’re not into lime and cilantro or parsley, try the lemon and dill she suggests. Don’t like mayo? Use yogurt. Or, skip the creamy dressing entirely!. Make a variation with minced jalapeno, olive oil and ground cumin, or a a version with a dressing of toasted sesame oil, miso, rice vinegar, ginger and garnished with toasted black and/or white sesame seeds. 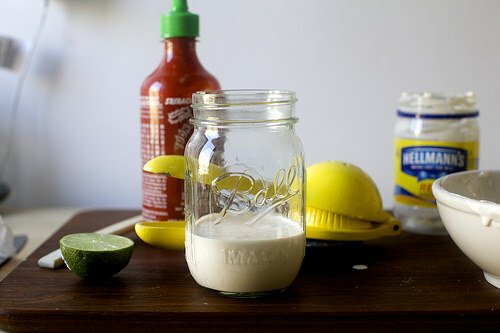 Whisk together mayo, lime and seasonings, adjusting levels to taste. 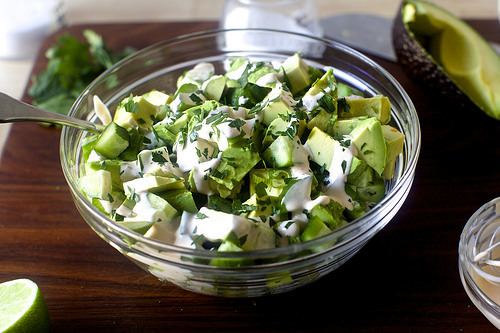 Drizzle salad with dressing and garnish with cilantro or parsley. Repeat again tomorrow.